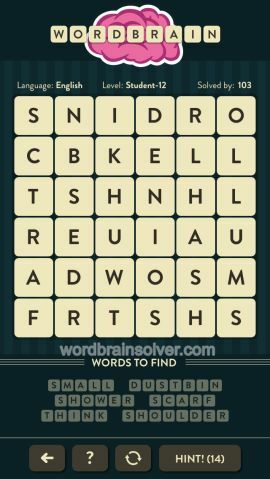 Wordbrain Student Level 12 Answers and Solutions. Any response to what i posted on March 7? Or i forget about this game? I have the same problem and I know the right answers. But the letter configuration will not let me spell shoulder at the end. I haven’t found anyone with a solution. I am about to hang it up–too frustrating with the letter combinations won’t work. They look correct to me. Anyone else has the same issue? Right, but I can’t make it work! What’s the order? Yes I did. Cannot figure out the solution. I’m having the same problem with student level 12. I have stomach not dustbin. Has anyone got a solution yet? I have the same problem have stomach and not dustbin. Cannot get to shoulder and therefore stuck. Cannot move on. Please help me get through Student 12 –answered or not. Dustbin is not there. Should be stomach. Dustbin shows in the solution. You have been making good money from me, as I use s lot of hints. Please handle this. Please write back to me to let me know the status. THANK YOU!!! I’ve been pondering over this for two days and was getting incredibly frustrated with it. Thank you! I was thinking it was impossible! Thank you so much, I was about to give up on this. God blesd you. I am almost 67 and I could see my life flashing by trying to solve this one. You are a life saver Steph!!! Thank you! You are my hero! Thank you! I’ve been stuck for weeks! Steph, you nailed it! Thanks so much! So frustrating! About to throw in the towel!